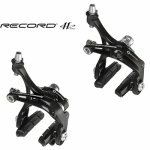 Top of range Campagnolo Record and Super Record 10 and 11 Speed Skeleton Brakes: The 11 speed brakes have been designed to be more rigid and lighter, and produce more powerful and progressive braking. Super Record Skeleton brakes are the result of a very careful study of every single detail. The Skeleton structure permits lightness and rigidity. The geometry differentiated between front and rear ensures maximum braking power on the front wheel and great progressiveness for the rear. Titanium is used for the screws, saving weight. Double front fulcrum and single on the rear. Forged aluminium. Skeleton structure. Orbital pad adjustment. Mechanisms on bearings.